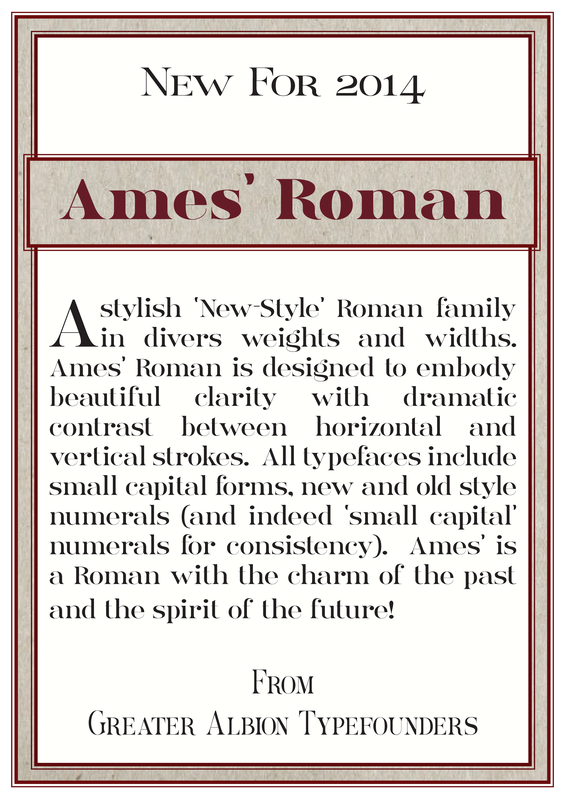 We expect to send our Amersham and Ames’ Roman typefaces off to our resellers in the near future. Ames’ Roman is to be a family of sixteen typefaces and is a stylish ‘New-Style’ Roman family in divers weights and widths. Ames’ Roman is designed to embody beautiful clarity with dramatic contrast between horizontal and vertical strokes. All typefaces include small capital forms, new and old style numerals (and indeed ‘small capital’ numerals for consistency). Here’s a download link for catalogue pages illustrating all sixteen typefaces in the family. We will publish some examples of the family in use shortly.